It's a travel day for me, and although I have an NCAA notebook post planned, with brief pieces of information and my observations from the 12 days that didn't fit into my daily recaps, it will be after I've gotten some sleep and can think clearly. At the French Open juniors, three US players have reached the round of 16 in singles--Marcos Giron, Bjorn Fratangelo and Vicky Duval. The top seven girls seeds have advanced to the third round, including No. 5 Monica Puig of Puerto Rico, but the boys draw has already lost top seed and Australian Open boys champion Jiri Vesely and second seed Hugo Dellien of Bolivia. There two French wild cards remaining, one of whom, Laurent Lokoli, is the reigning Orange Bowl 16s champion. Two qualifiers are also still in contention Miki Jankovic of Serbia, who has reached the quarterfinals, and Oriol Roca Batalla of Spain. Neither Giron nor Fratangelo faced a seed in the first two rounds, but will on Wednesday. Giron meets No. 4 seed Oliver Golding of Great Britain in a battle of two brillant forehands, while Fratangelo plays No. 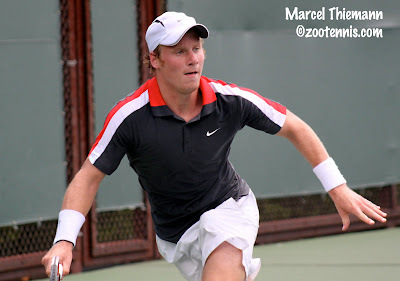 11 seed Joris De Loore of Belgium, who reached the semifinals of both the Eddie Herr and Orange Bowl last year. Duval will also play a seed on Wednesday when she takes on No. 4 Natalija Kostic of Serbia. Duvalis playing doubles with Australian Ashleigh Barty, and they won their opening match. Two US boys doubles teams are still alive, with Mitchell Krueger and Shane Vinsant into the quarterfinals, where they'll face top seeds Golding and Vesely. Fratangelo and Alexios Halebian also won their first round match. The schedule and draws can be found at rolandgarros.com. The ITF junior website also is posting daily articles from Paris. Belgium's An-Sophie Mestach, who is actually No. 1 in the world (Russian Daria Gavrilova finished 2010 as world junior champion), was injured in the Grade 1 in Belgium last week and withdrew. While Division I was in Northern California, the NCAA Division III individual championships were going on in Southern California, at Claremont-Mudd-Scripps and Pomona-Pitzer. CMS claimed a national title, with sophomore Kristin Lim defeating Kendra Higgins of the University of Chicago 6-1, 6-3 for the women's singles. Emory was assured a national champion when teammates Michael Goodwin and Dillon Pottish met in the final. It was Goodwin who took the title, joining his older brother Michael, who won the championship while at Emory in 2009. Goodwin, the fourth seed, beat Pottish, the top seed, 6-2, 7-6(3). The final team rankings are out, and unsurprisingly, National Champions Florida and USC are at the top, marking the end of a controversial four months. Or is it? 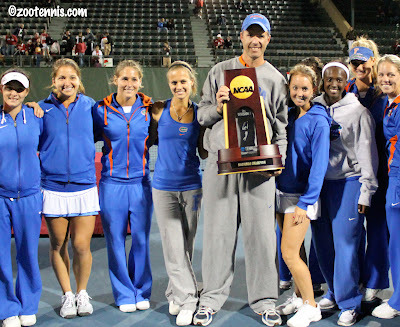 Grant Chen, Director of Tennis Operations at UCLA, tweeted today that the top 2 women's programs, which are Florida and Stanford of course, are not participating in next week's ITA kickoff weekend draft for the 2012 Indoor Team Championships. Stanford and Florida have frequently skipped the event, so it's difficult to say whether this is the result of this year's ranking mess or unrelated. For the complete and final team rankings, see the ITA website. The University of Southern California's Steve Johnson may have his playoff mustache a bit longer. Vowing not to shave it until a loss, the junior from Orange, Calif. went undefeated in his 12 days at the Taube Family Tennis Center. After leading USC to its third consecutive team championship last Tuesday, the top seed, healthy and grateful for the cool Northern California weather, relaxed and swung away in the individual tournament. That too ended in a championship, with his 4-6, 6-2, 6-1 victory over Tennessee's Rhyne Williams in Monday afternoon's singles final. "I was more nervous for the team event than I was today," said Johnson, who was named the tournament's Most Outstanding Player. "The goal the whole year was to win the team thing, and I felt like there was a lot more pressure on my shoulders there than there was today. Today was just another match, and I went out there and stayed focused. I didn't let myself get down after that first set." Johnson was broken at love in the first game of the match, and with Williams, a sophomore from Knoxville, Tenn., hitting outright winners and serving well throughout the first set, the break held up. But Johnson broke to open the second set, and began serving more effectively himself, while the errors that were absent earlier began to creep into Williams' game. "I served pretty well in the first set, but then maybe my legs died a little bit," said Williams, seeded fourth in the tournament. "I was a little tired from the match yesterday with Tennys (teammate Sandgren), so my serve kind of went downhill after the first set." Johnson broke Williams for a second time to end the second set, giving him the advantage of serving first in the final set, but even when Johnson took a 2-0 lead in the third, Williams could take comfort in their previous meeting. 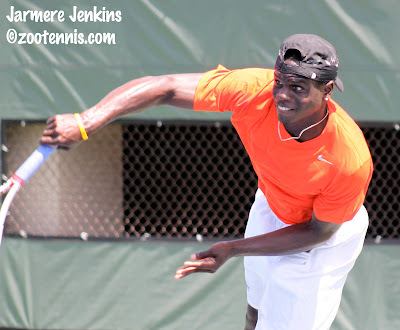 In the finals of the USTA/ITA National Indoor championships in New York last November, Williams trailed Johnson 2-0 in the third before coming back to take the final set 6-4 to dethrone Johnson, the defending champion. "When I got up 2-0 in the third, I was going to do anything it took to hold," Johnson said. It was his lethal forehand that did the job, with two clean winners securing that game to make it 3-0. Williams then held for 3-1, but he couldn't locate enough energy to reverse the course of the match, as he had done in New York. "Woody (associate head coach Chris Woodruff) actually came out and reminded me of that," Williams said. "I tried to fight, but there really wasn't much left in the tank, sadly. He really stepped up his game in the second and third set and I couldn't really hang." A small but vocal group of USC supporters, including one with a sign reading "Fear the 'Stache", sensed Williams' fatigue, and their voices rose with excitement after Williams was broken to make it 5-1. As Johnson stepped to the line to serve for the championship, there was no distraction from the women's final, which had finished on an adjacent court just a few minutes before. The Cardinal fans, who were the majority of the 1763 spectators in attendance, had just witnessed Stacey Tan's valiant comeback fall short against Jana Jurikova of Cal, so they turned their attention to the end of the men's match while waiting for the award ceremony and doubles finals. Johnson earned two match points when Williams' backhand went wide at 30-15, but failed to convert the first one when he netted a volley. But as it had all year, Johnson's serve came through on the next one, with a big first serve to Williams backhand that he was unable to get back into play. After a short celebration and the handshake, Johnson sought out his mother in stands and gave her a long hug as he accepted congratulations from friends and fans. All underclassmen who earn NCAA singles championships face questions about returning to school, and Johnson is no different. 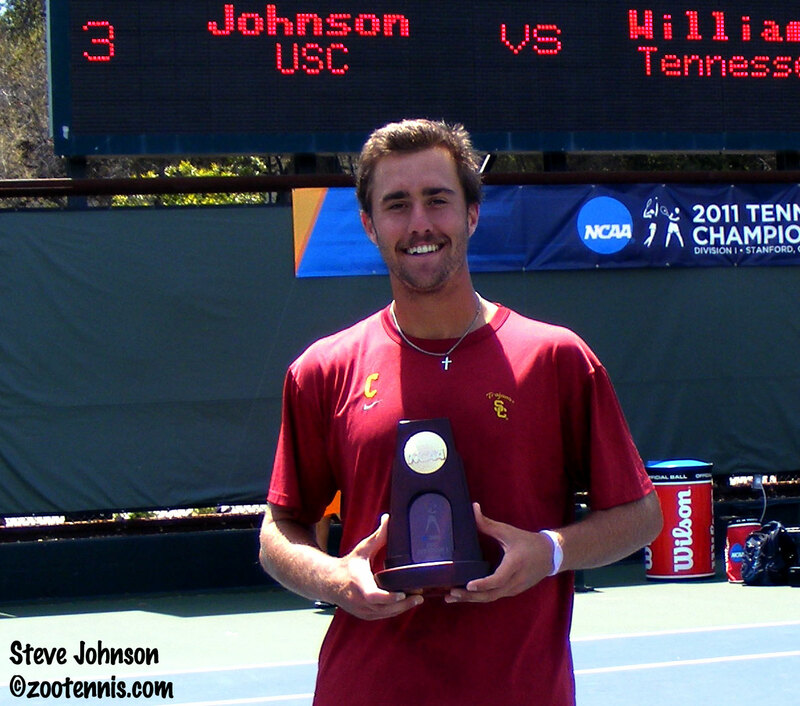 With only three losses in the 2010-11 college season, a 35-match winning streak since January and the team and individual titles, Johnson has dominated college tennis this year. 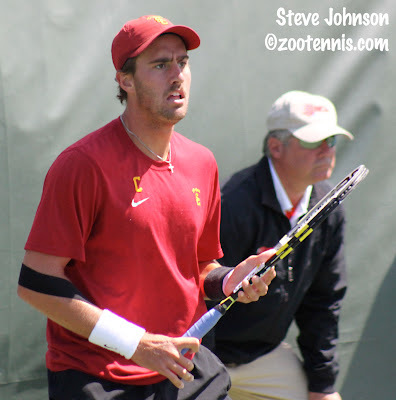 But despite USC head coach Peter Smith's belief that Johnson is ready for professional tennis now, it's possible he'll return for his senior year. "It's weird being in this position, because coming in as a freshman, I had no idea that as a team, we could win three national titles in a row," said Johnson, the first Trojan to win the singles championship since Cecil Mamiit in 1996. "Only the one Paul Goldstein Stanford team has won four. That's such an incredible opportunity, and I feel like I've been through it for three years with Daniel (Nguyen) and those guys, and I feel like we'll be back and better for next year. I really want to come back and win that fourth." Johnson, now seven classes short of graduation, is planning to take the fall semester off to play professional tournaments as an amateur, beginning with two Pro Circuit Futures events in California next month. He also has a slightly bigger event on the horizon, with the US Open main draw wild card that goes to an American NCAA champion. "Every American (college player) I've talked to, that's your goal," said Johnson. 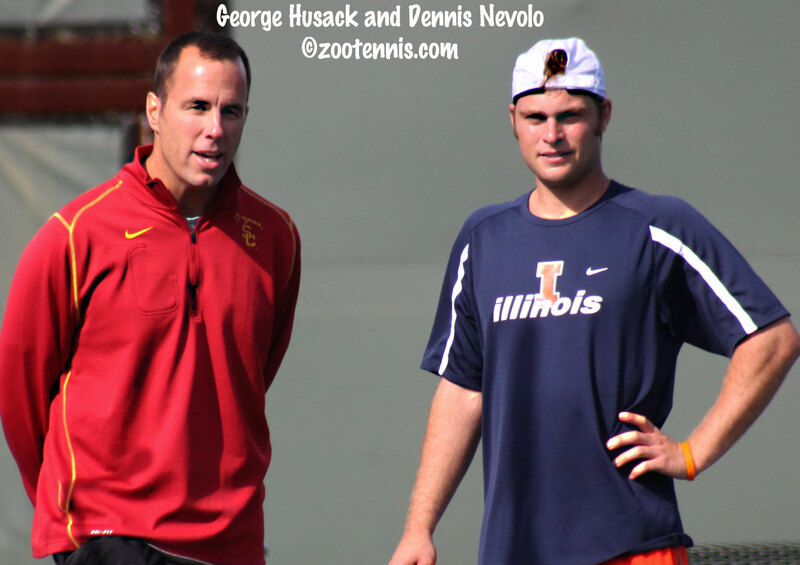 "Win the NCAAs and that's your ticket to the US Open, to play with the big boys and see how good you are." In the women's final, top seed Juricova of Cal was returning to the final for the second consecutive year, and although she was again facing a local favorite on her home turf in Tan, the Taube Family Tennis Center courts gave her a certain level of comfort. "We play so many matches at Stanford, and I've played so many matches on Court 1, it doesn't really feel like I'm playing away," said the junior from the Slovak Republic. "Especially because of the fans, I kind of feel like I'm playing at home too." Although the applause for Juricova's winning shots was not the same decibel level that Tan experienced, a substantial number of Cal fans made their way across the Bay, and they plenty to cheer about in the first set, with Juricova blanking a nervous Tan 6-0. The second set was much closer however, as Tan held in her first two service games and was able to get her first break of the 6-foot right-hander after Tan had dropped serve herself the previous game. Juricova, who had reached the last five national singles championships, served for her second collegiate major at 6-5 in the second set, but the unseeded Tan, who played No. 5 for Stanford most of the dual season, broke back to force a tiebreaker. But as she had done against Stanford's Nicole Gibbs in the third-set tiebreaker that decided their semifinal, Juricova displayed her best serving of the match in the tiebreaker, taking a 6-0 lead before Tan won a point. "I decided to really go for it," Juricova said. "Take my best shot and really take time away from her. I decided to do that, and I think that's why the tiebreaker went so well." 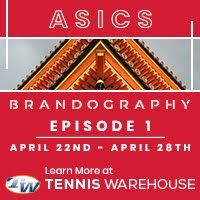 Tan, a sophomore from Lakewood, Calif., was able to hit her share of winners once she got comfortable, but her serve was no match for Juricova's, who regularly teed off on Tan's serves. "I feel she has a really powerful game," Tan said. "She has strong shots, especially her serve. But at the same time, she can be really consistent and knows how to reset points pretty well." Tan saved two of the six match points against her, but Juricova claimed the title 6-0, 7-6(2) when Tan's backhand failed to clear the net." "I feel like she did step up, especially her serving points in the tiebreaker," Tan said. "She went for it more. It looked like she just started going for them and they went in pretty well." Cal coach Amanda Augustus was happy to see her player take charge in a final. "That's something we've been focused on this entire semester, but really probably since the final last year," said Augustus, who won NCAA doubles title in 1998 and 1999. "She's gotten to the point when she's out there in these matches that she sees what's going on, sees the opportunities she can create with her game, and it's more trusting herself, and believing her game, in a finals situation, is enough." 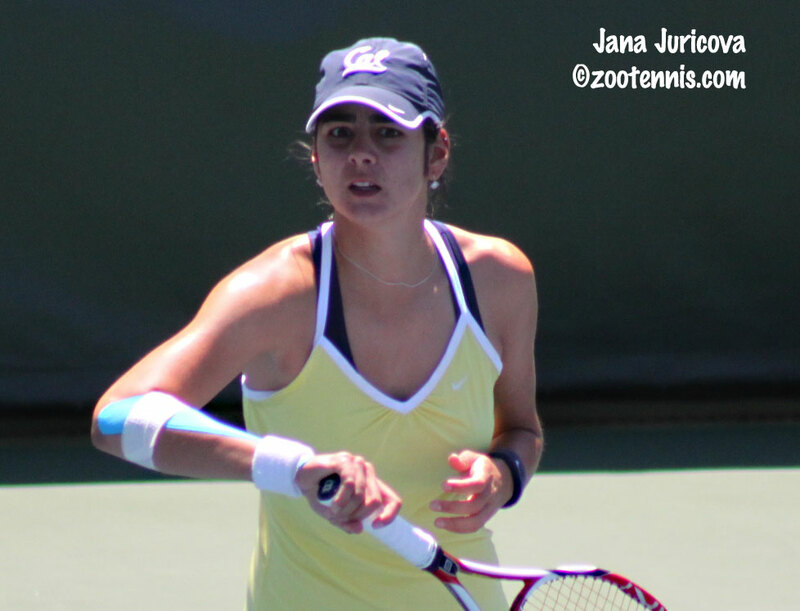 With the win Juricova could put aside the losses to Chelsey Gullickson in last year's NCAA final, to Hilary Barte in the All-American final, and to Maria Sanchez in the USTA/ITA Indoor final, and focus on her place in Cal tennis history, joining Suzi Babos as a national singles champion. 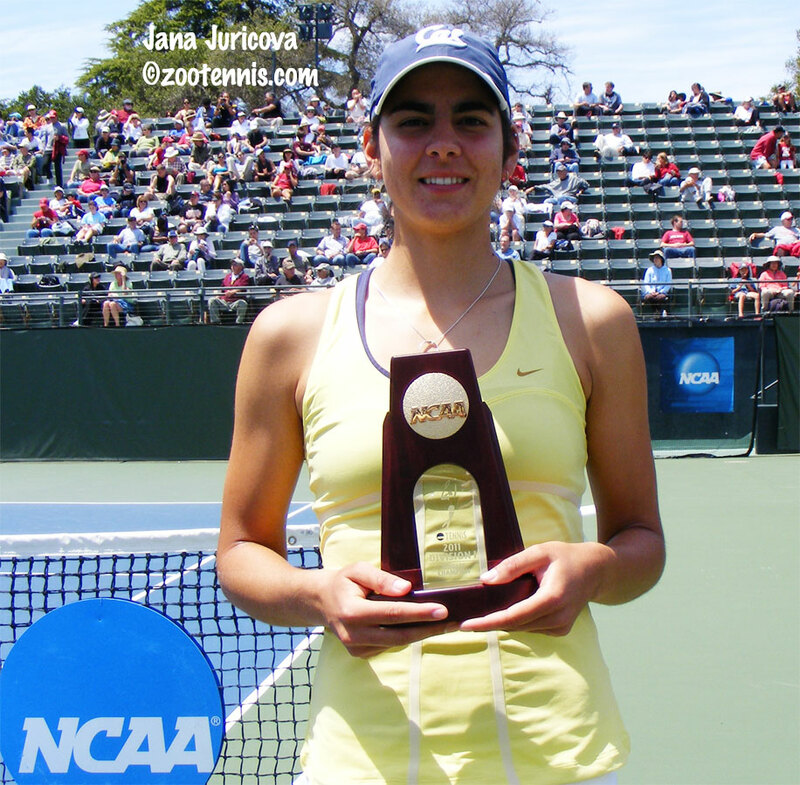 "She was in her last semester when I got here, and I remember she came and talked about how she won the title at Stanford (in 2006)," Juricova said. "I was really impressed, and I was like, wow, I want to do that too." 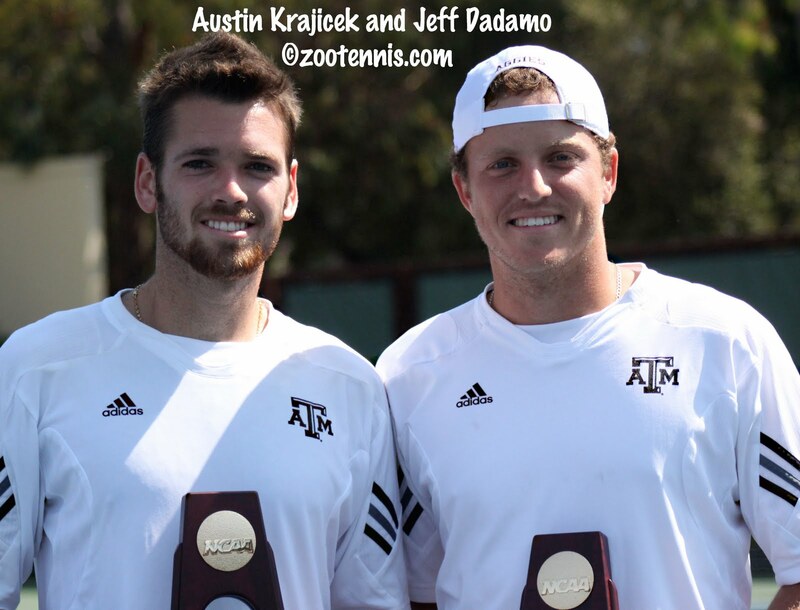 In the men's doubles championship, Jeff Dadamo and Austin Krajicek collected Texas A&M's first national tennis title when they downed No. 5 seeds Bradley Klahn and Ryan Thacher of Stanford 7-6(4), 6-3. "I think we've had a good tournament all week," said Krajicek. "We served very well on these courts. They're playing a little faster, so they suited our games well." Seniors Dadamo and Krajicek, the No. 3 seeds, won the USTA/ITA Indoor title last November, so the pair of left-handers will be leaving college tennis and heading to the professional circuit with two consecutive national championships on their resumes. The expectation is that they will also receive a US Open main draw wild card, which will not be a new experience for Krajicek, who received one in singles after he won the 2008 18s USTA Nationals in Kalamazoo. "I can't wait to go back," said Krajicek. "I love New York, it's probably my favorite tournament. It's an incredible atmosphere, being an American and playing there." Dadamo, who played the US Open junior championships, is also excited about the possibility. "It's going to be a lot of fun, and a pretty good atmosphere, obviously," Dadamo said. "It'll probably be a little easier out there playing doubles, with my friend Austin, and concentrating on the stuff we're trying to do on the court. But it'll definitely be a lot of fun." 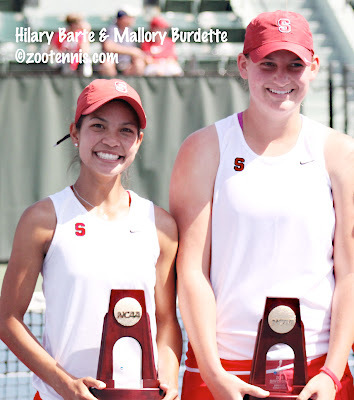 In the women's doubles, Hilary Barte defended her title, which she won last year with Lindsay Burdette, with Burdette's younger sister Mallory. Barte and Burdette, seeded fourth, trailed Clemson's Josipa Bek and Keri Wong 6-1 in the first set tiebreaker, but won seven straight points and then six more consecutive games to take a 7-6(6) 6-0 victory. "They got a little bit tight and we stepped it up," said Barte. "At 6-4, Mal hit a really great return and a great forehand, and I think that really turned the momentum in our favor." Burdette, who now will have her name on the wall of champions, along with older sisters Erin and Lindsay, credited the crowd with assisting their comeback. "The crowd was awesome," said Burdette. "Obviously, throughout the team event the crowd was great as well. I was very surprised how many people came out, and I'm very happy about that. It always makes things fun." For Barte, ending her career with another doubles title took the edge off Stanford's 4-3 loss to Florida in the team final. "I wish we could have won the team, and that would have made it a lot sweeter," Barte said. "But to go out (a champion) in my last match in a Stanford uniform, you couldn't write a better script." It's not often a NCAA semifinal match decided in a third set tiebreaker gets overshadowed, especially if the contestants are two Bay area players, one on her home courts. But Cal-Berkeley's Jana Juricova, who is returning to the finals for the second consecutive year after a 6-7(5), 7-5, 7-6(2) victory over unseeded Stanford freshman Nicole Gibbs, wasn't the story. 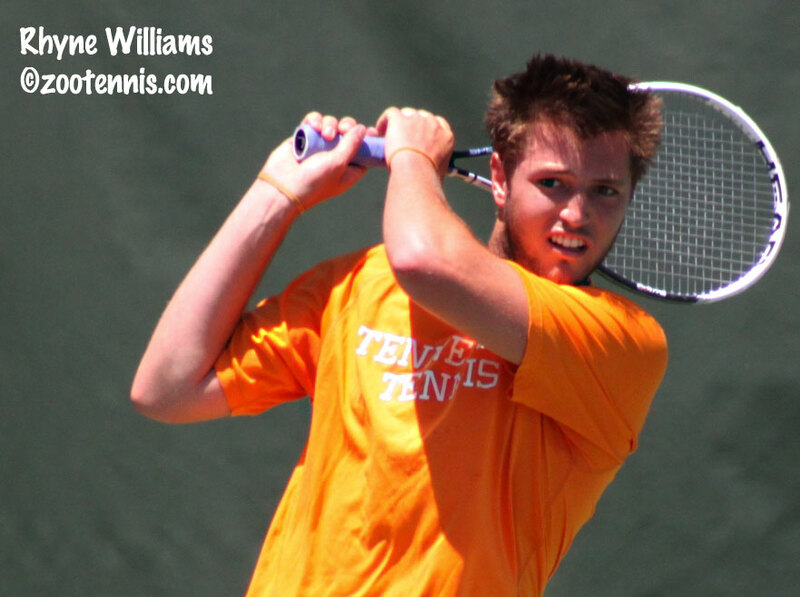 Nor was the all-Tennessee semifinal between best friends and roommates Rhyne Williams and Tennys Sandgren, which Williams won 6-3, 3-6, 6-0. Even Stanford's Stacey Tan was an afterthought, despite her improbable run to he final as an unheralded sophomore playing at the No. 5 position most of the year. Tan advanced to the women's final when Florida's Lauren Embree, the heroine of the team event, was forced to retire with a foot injury at 5-7, 6-3. Yet for all that drama, the fans, coaches, players and volunteers at the Taube Family Tennis Center were talking about only one thing late Sunday afternoon-- the University of Virginia's Michael Shabaz, who abruptly retired after a point penalty down 7-6(4), 4-2 in his semifinal match with Steve Johnson of Southern California. The controversy began in the first set, with Johnson serving at 5-6, 30-40, a set point, and only the third break point of the match to date, with Shabaz having saved two in the previous game. "We had a three, four ball rally and he hits a slice that I thought was clearly out, a couple of inches," said Johnson, who gestured in dismay after he returned the shot. "The referee on the line didn't call it, but the chair overruled it, which I felt was the right call, but I guess he feels differently, and most of the UVA people here feel differently." Playing with a full complement of line judges for the first time, after the players had called their own lines through the quarterfinals with a chair to overrule clear mistakes, there was an adjustment to be made. Although both players adapted quickly to the change, the first set tiebreaker brought another controversial call, or lack of one, irritating Shabaz again. Serving at 5-4, Johnson hit a surprise kick first serve, which Shabaz didn't get back in play, giving Johnson two set points. On Johnson's next first serve, a flat one, Shabaz thought it was long, making no move to Johnson's return of his return. The chair umpire, Michael Standrod, called the score, game and first set to Johnson, while Shabaz pleaded his case. During the set break, Shabaz continued to discuss the failure of the chair to call a fault, especially since he had overruled on the previous set point. "I couldn't tell you, it was close either way," Johnson said of his serve. "It's hard for me to tell. Peter (Smith, USC head coach), for what it's worth, told me it was good, whether he was just saying that because he's my coach, or because it was good, I don't know. But it's tough to see, it's tough conditions, but sometimes it doesn't go your way and you have to be ready for anything." The second set started as the first had, with no break points and easy holds through the first five games. Serving at 2-3, 30-15, Shabaz hit a forehand wide, and on the next point Johnson came up with an audacious dipping cross court pass to make it 30-40. Shabaz missed his first serve, and as the ball came back to him he swatted at it, with some anger but not any visible emotion. Unfortunately for him, the ball left the stadium, and the chair called out point penalty, unsportsmanlike conduct, game Johnson. As both players walked to the bench, Shabaz approached Johnson and shook his hand, while Virginia head coach Brian Boland, who was watching from the stands, could be heard to shout, "No, Shaz, No." Shabaz put his racquet in his bag and walked off the court, while all 1500 fans, who had been treated to an extremely high-quality display of tennis to that point, sat in stunned silence. "I'm speechless," said USC head coach Smith, who said he had never seen a match end that way in his over 20 years of collegiate coaching. "I actually feel sorry for all those involved. Michael is a way better person than that, and that program's a way better program than that. There were some missed calls, but that's tennis, if you've got umpires or not. I've got a lot of text messages asking me what just happened." Cavalier head coach Boland described himself as speechless, but went on to elaborate on his disappointment with the 23-year-old senior from Fairfax, Virginia. "We've had an unbelievable relationship for four years, he's grown incredibly, and I am completely, totally sad and very disappointed," Boland said, his voice catching with emotion. "I still cannot believe he walked off the court. That being said, I know his emotions were at a high point, and he was in complete disagreement with the umpire, and I know it's not personal towards anyone. I think it was an emotional reaction, and it's very disappointing." “I couldn’t really see that he was tired, but some of the shots he was missing, I was like, he’s got to be tired, because normally he wouldn’t make these errors,” Sandgren, also a sophomore, said of his comeback in the second set. Gibbs held her nerve serving at 5-6, sending the match into the ultimate pressure cooker, while cheers of ‘Let’s Go Stanford” reverberated throughout the stadium. Both Tan and Embree played three-setters in the team final, but although Tan called the stretch of matches the past two weeks “exhausting,” it was Embree who broke down physically. “The nail was torn off her toe and she was having real issues with her skin,” said Florida head coach Roland Thornqvist, explaining the injuries that caused Embree to retire. The University of Tennessee’s Rhyne Williams and Tennys Sandgren warm up together, train together, travel together, play doubles together, and are occupying the same hotel room during the NCAA team and individual championships. But after they face each other Sunday, the togetherness will end, with only one of them earning a place in Monday’s NCAA singles final. At the completion of his match, Williams was able to watch best friend Sandgren take on unseeded Marcel Thiemann of Mississippi, who had reached the quarterfinals for the second consecutive year. Sandgren, a sophomore playing in his first national individual competition, showed no sign of nerves, overcoming a 0-40 deficit and a bit of controversy to serve out a 6-3, 6-4 win. Using his serve and forehand to control points, Sandgren held the advantage throughout his match with Thiemann, a junior from Germany. At 3-3 in the second, Sandgren got a break, but it looked as if he wouldn’t hold it when, serving for the match, his two unforced errors made it 0-30. A ball rolling from the doubles match on the adjacent court negated a point Sandgren was in position to win, and he lost the replayed point to go down 0-40. Rather than get rattled however, Sandgren regrouped to win the next five points, the final one with an ace. Due to the noon start for to the NCAA individual quarterfinals today, there's time for a quick post about the French Open Junior Championships, which begin Sunday in Paris. Three girls--Vicky Duval, Christina Makarova and Stephanie Nauta--and seven boys--Shane Vinsant, Alexios Halebian, Marcos Giron, Mitchell Krueger, Dennis Novikov, Bjorn Fratangelo and Mac Styslinger--will represent the United States on the red clay of Roland Garros. Duval, who lost to Australia's Ashleigh Barty of Australia in today's ITF Grade 1 Astrid Bowl final, will play a qualifier in the opening round, probably Monday. Makarova drew No. 2 seed Irina Khromacheva of Russia, the Italian Open junior champion, and they are scheduled to play Sunday, as is Nauta, who got in as a lucky loser, the only one in either draw. That spot is the result of the late withdrawal of Australian Open girls champion and ITF top-ranked junior An-Sophie Mestach of Belgium, who retired from her first match at the Astrid Bowl earlier this week. Six of the seven American boys, none of them seeded, will play Sunday, with Marcos Giron, Alexios Halebian, Mitchell Krueger, Dennis Novikov, Bjorn Fratangelo and Shane Vinsant in action. Vinsant and Halebian have drawn French wild cards and the other four drew unseeded players. Only Styslinger, who is not on Sunday's schedule, will be a decided underdog. He will play fellow Bollettieri student Hugo Dellien of Bolivia, the No. 2 seed, in the opening round. Based on his performances at the Italian Open last week, where he reached the quarterfinals before losing to eventual winner Filip Horansky of Slovakia, Fratangelo may be poised for a good run in Paris. He feels clay suits his game, despite having grown up on indoor hard courts in Pittsburgh, and since he has been training on Har-Tru in Florida the past few winters, he has really grown comfortable on the surface, as his back-to-back USTA National Clay Court titles in 2009 and 2010 attest. The ITF junior site posted this preview, and I am again hoping to get updates from Guy McCrea, who is in Paris, and has always taken a keen interest in the juniors. For complete draws and live scoring, see rolandgarros.com. 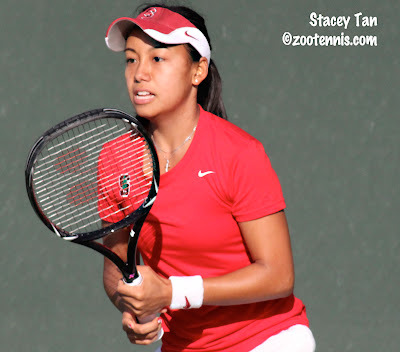 Fifteen-year-old qualifier Taylor Townsend has reached the semifinals of the $50,000 Pro Circuit event this week in Carson, California. She will play No. 2 seed Alexa Glatch at the Home Depot Center today. USTA press aide Steve Pratt has also uncovered the hockey connection of quarterfinalist Jessica Pegula: her father Terry recently purchased the NHL Buffalo Sabres. The complete story is here. 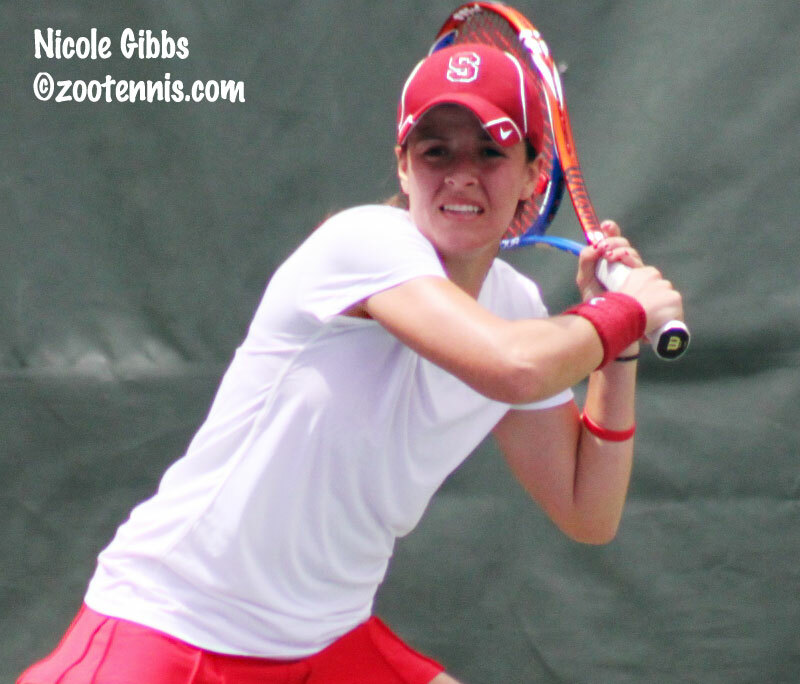 Stanford’s Nicole Gibbs trailed No. 6 seed Allie Will of Florida 5-1 in the final set of their third round match Friday, and despite her reputation as a fierce competitor, the 18-year-old freshman was about to pack it in. Her teammates and local fans had seen her squander a 6-3, 5-2 lead, drop the second set tiebreaker to the Gator sophomore, and lose game after game in the third. But they stuck with her through the 3 hour and 52 minute match, and Gibbs gave them the credit for her 6-3, 6-7 (5), 7-6 (3) win. Will served for the match three times in the third set, at 5-2, 5-4 and 6-5, but the three match points Gibbs saved came when she was serving at 3-5. Looking for her forehand at every opportunity, Gibbs hit winners from that side on each match point, which isn’t easy to accomplish with Will’s excellent defensive ability. With all the momentum on her side after winning four straight games, Gibbs then faced another challenge. At 3-3 in the tiebreaker, Gibbs snuck into the net and guided a volley into the open court. A big Gibbs forehand forced Will’s forehand reply just long, and an errant backhand gave Gibbs her first match point at 6-3. Gibbs worked herself into position and blasted a forehand winner deep in the backhand corner, ending what Stanford head coach Lele Forood called a “titanic” battle. Gibbs will play teammate Hilary Barte in the quarterfinals. The third-seeded Barte beat Maria Mosolova of Northwestern, a ninth seed, 6-3, 6-2. 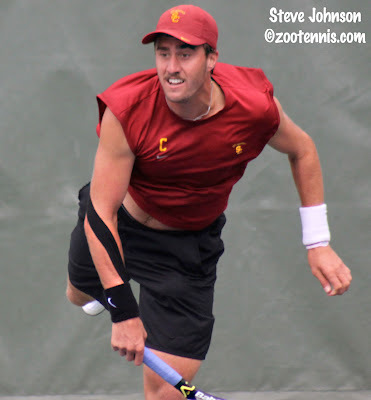 Top seed Steve Johnson of Southern California and JP Smith of Tennessee, seeded ninth, provided the early morning drama, with Johnson claiming a 7-6(3), 3-6, 7-6(2) victory, to keep alive his quest to add an individual title USC’s three consecutive team championships. Smith played outstanding tennis throughout the match and led 4-2 in the final set, but Johnson scrambled his way back, saving a break point down 2-4, then breaking Smith in the next game to pull even. Smith’s serve was the culprit in that critical break, with Johnson getting a look at second serves in six of the eight points. When the match reached the final tiebreaker, Johnson elevated his game, making every first serve and finishing with an ace and a service winner. Johnson said he might have lost his focus in the second set and got a little lucky in the seventh and eighth games of the third, but didn’t indulge in any false modesty about his play in the two tiebreakers. Smith, only the second player in Division I college tennis history to be named an All-American eight times, regretted not taking his opportunities. Johnson’s quarterfinal opponent is No. 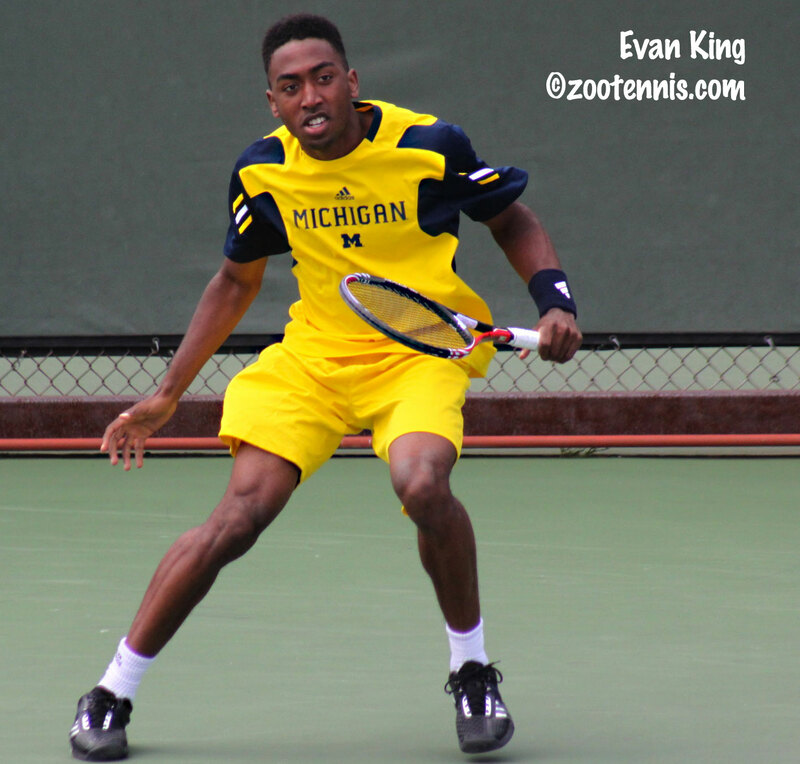 5 seed Blaz Rola of Ohio State, who defeated unseeded Evan King of Michigan 6-3, 6-0. Defending champion Bradley Klahn of Stanford, seeded ninth, also needed a comeback, trailing Jose Hernandez of North Carolina 4-2 in the final set before recovering for a 6-3, 3-6, 6-4 victory. At one stage of the match, between the sixth and tenth games of the third set, Klahn won 14 straight points, with the unseeded Hernandez making error after error as the match slipped away. Klahn will face Tennessee’s Rhyne Williams, the fourth seed, who defeated ninth seed Guillermo Gomez of Georgia Tech 7-5, 6-4. Strangely, the two 20-year-olds haven’t met in six years, despite parallel careers in juniors and college. 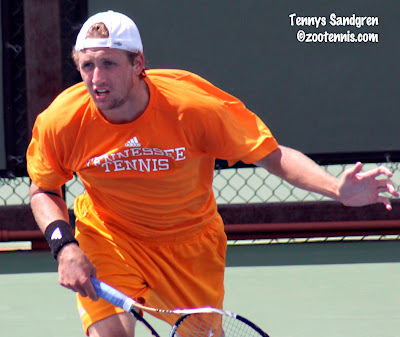 An all-Tennessee semifinal is possible, with Tennys Sandgren also reaching the quarterfinals with a 6-4, 7-6(4) win over Sebastian Fanselow of Pepperdine. The unseeded Sandgren, a sophomore, will need to get past Marcel Thiemann of Ole Miss, who reached the quarterfinals for the second consecutive year with a 6-4, 6-4 victory over Raymond Sarmiento of USC. The fourth quarterfinal finds No. 3 seed Michael Shabaz of Virginia against No. 8 seed Henrique Cunha of Duke. Shabaz beat 2010 finalist Austen Childs of Louisville 7-5, 6-4, while Cunha fought back to take a 4-6, 6-3, 6-2 decision over ninth seed Dennis Nevolo of Illinois. The marquee contest of the women’s quarterfinals is a rematch of the 2010 final, with Georgia’s unseeded Chelsey Gullickson, last year’s champion, meeting this year’s top seed Jana Juricova of Cal-Berkeley. Gullickson defeated Juricova in a dramatic comeback after falling behind 4-1 in the third set to lead Georgia to a 4-3 victory over Cal in the first round of the team tournament. On Friday Gullickson defeated ninth seed Zoe De Bruycker of North Carolina 6-1, 2-6, 6-2, her third consecutive three-set win, while Juricova picked up another routine victory, beating ninth seed Venise Chan of Washington 6-3, 6-2. 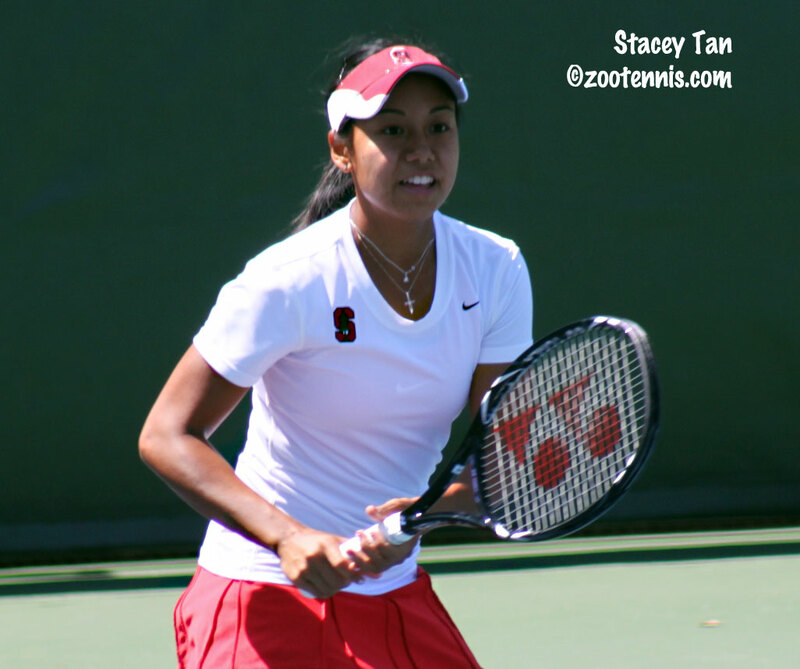 The Pac-10 can claim five of the eight women’s quarterfinalists, including a third Stanford player, unseeded Stacey Tan. Tan defeated Texas’s Aeriel Ellis 6-4, 7-6(6) to set up a meeting with Baylor’s Nina Secerbegovic, who downed Lindsey Hardenbergh of Virginia 6-2, 6-3. Mari Andersson of Cal-Berkeley will meet the team championship’s most outstanding player Lauren Embree in another battle of unseeded players. Embree cruised past Indiana’s Leslie Hureau 6-1, 6-0; Andersson beat ninth seed Jacqueline Cako of Arizona State 6-3, 6-0. Two of the top contenders for the men’s doubles title were eliminated Friday, with top seeds Smith and Boris Conkic of Tennessee and defending champions Shabaz and Drew Courtney of Virginia bowing out. Georgia Tech’s Kevin King and Juan Spir defeated Smith and Conkic 6-3, 6-4, while Florida State’s Vahid Mirzadeh and Connor Smith took down the No. 2 seeds Shabaz and Courtney 6-4, 3-6, 6-1. Saturday’s quarterfinal action begins at noon Pacific time. For complete results, see gostanford.com. Before third round action begins Friday in Palo Alto, I wanted to pass along these links. The Williams women won their fourth consecutive NCAA Division III title (USC men are on notice) yesterday, beating Amherst 5-4, in a match that came down to a tiebreak in the deciding match, just as the Florida-Stanford women's D I final did. For more, see ncaa.com. The Amherst men, who lost in the finals the last two years, beat Emory 5-2 to claim the championship. For more, see ncaa.com. My recap of the NCAA Division I team championships for Tennis Recruiting Network can be found here. A chance to earn one of college tennis's most coveted titles was on the line Thursday during the second round of the NCAA Division I Individual Championships. One of the criteria for being named an All-American couldn't be simpler: reach the round of 16 at the individual tournament. Those seeded had already assured themselves of the honor, but an additional 15 men and women earned a place in their program's history with victories Thursday. The University of Virginia's Lindsey Hardenbergh, became the first woman to earn All-American honors in the school's history when she defeated Connie Hsu of the University of Pennsylvania 6-4, 6-4. Hardenbergh, a junior from Fairfax, Virginia, trailed 4-1 in the opening set before rallying for the win on another brisk and breezy day at the Taube Family Tennis Center. Although Hardenbergh's match was a close one, it didn't compare to Mississippi's Marcel Thiemann's 1-6, 6-4, 7-6(5) win over No. 7 seed Eric Quigley of Kentucky. Thiemann, a junior from Germany, saved four match points to eliminate Quigley from the NCAA tournament for the second year in a row. Quigley had three match points serving at 5-3 in the third set, but Thiemann denied them all. Serving to stay in the match, Thiemann faced a fourth match point, but a Quigley backhand sailed long, and Thiemann held. In the deciding tiebreaker, the pair of SEC rivals exchanged mini-breaks early, then held serve the rest of the way. With Quigley serving at 5-6, he netted his first serve, then tried a surprise serve and volley on the second, but missed the volley to give Thiemann the win on his first match point. "He's an amazing player,” said Thiemann, who earned All-American status for the second time with the victory. “He would have deserved it just as much to win." University of Texas sophomore Aeriel Ellis faced a difficult task in her quest for All-American status after dropping the first set to No. 4 seed Denise Dy of the University of Washington, but the Californian, ranked 21st, went on to post a 4-6, 6-3, 6-2 upset. The other major surprise in the women’s draw was the elimination of No. 2 seed Maria Sanchez of Southern California. Sanchez was beaten by Mari Andersson of Cal-Berkeley 6-2, 6-3. Men's top seed Steve Johnson posted his 31st consecutive win Thursday, defeating Pac-10 rival Daniel Kosakowski of UCLA 6-2, 6-1. It was his fourth victory over the Bruin freshman this year. Trojan freshman Raymond Sarmiento earned his All-American designation with a 1-6, 6-4, 7-5 victory over crosstown rival Amit Inbar of UCLA, but teammate Daniel Nguyen, who clinched Southern California's 4-3 win over Virginia in the team championship fell short of that honor. Nguyen bounced back to take the second set from Illinois's Dennis Nevolo, a 9 seed, but a shoulder strain prohibited him from finishing the nearly three-hour match, which ended with a 6-4, 5-7, 5-2 ret. scoreline. On the court during the match was USC associate head coach George Husack, who recruited Nevolo for Illinois when he was an assistant there three years ago. As for any scouting secrets he might have learned when coaching Nevolo as a freshman, Husack denied they would be of much value. Nevolo did see a change in Nguyen's tactics from the first set to the second however. Nguyen started hitting flatter and taking the ball earlier in the second set, his usual game style, and Nevolo had to adjust. As for seeing his former coach on the sideline throughout the match, Nevolo could joke about it, knowing Husack was within earshot. The morning after the team championships are always a bit disorienting, and given the two thrillers in the finals Tuesday, with Florida defeating Stanford 4-3, and Southern California topping Virginia by the same score, Wednesday's first round of the NCAA Individual Championships seemed especially anticlimactic during the first few hours. A light drizzle disrupted the morning's first matches, and although the skies cleared and four Taube Family Tennis Center courts usually reserved for practice were opened, most matches were delayed two hours or more, and continued late into the night. Upsets of players who compete in the team final are far from unusual, and Virginia freshman Alex Domijan, the No. 2 seed, was this tournament's first major victim. Domijan, who lost his third match of the season last Friday to Stanford's Ryan Thacher, lost his fourth on the same court Wednesday evening, with Pepperdine's Sebastian Fanselow beating the ITA Rookie of the Year 2-6, 6-4, 6-1. Fanselow, a sophomore from Germany, was as surprised as anyone by his performance. "I haven't played a match in four or five weeks," said Fanselow, whose team was not allowed by the school's administration to participate in the NCAA tournament when a financial aid irregularity was discovered. "I felt good before the tournament, but I didn't expect to beat a guy like Alex, who’s definitely a great player. Obviously, it could have been a better draw, but I was excited to play him." Domijan's groundstrokes and serve can dominate a match, but Fanselow's return game kept him even when Domijan was serving. Moving Domijan around the court is easier said than done when playing defense, but an energetic Fanselow was able to do that in the final two sets. "I just tried to keep the ball in play," the 28th-ranked Fanselow said. "He has huge ground strokes and a really big serve. I was trying to get him moving, get him running, and then try to play as aggressive as possible, and come to the net as much as possible." With teammate Finn Tearney also advancing to the second round, Fanselow could be positive about the future aspects of the Waves, despite not being allowed to compete in the team tournament. "This is definitely going to give us confidence, and hopefully next year we can play the team tournament too," Fanselow said. “It was really frustrating, to have a really great season and then getting that little disappointment at the end didn't really help much. But I guess you've got to look forward." The championship hangover is getting to be such a regular problem for three-time champion University of Southern California that they've begun to solve it. Although Jaak Poldma pulled out of the singles and doubles to prepare for his life after tennis, the other three individual qualifiers all advanced to the second round. Top seed and tournament Most Outstanding Player Steve Johnson defeated Texas A&M's Jeff Dadamo 6-4, 6-2, match clincher Daniel Nguyen beat SMU's Artem Baradach 4-6, 6-3, 7-5 and freshman Raymond Sarmiento upset Ohio State's Chase Buchanan, a 9 seed, 3-6, 7-6(2), 6-3. The two main protagonists in Tuesday’s dramatic women’s final, Florida’s Lauren Embree and Stanford’s Mallory Burdette, had mixed results. Embree, who came back from 4-0 down in the third set to win a tiebreaker that clinched the Gators’ championship, beat No. 7 seed Bianca Eichkorn of Miami 7-5, 6-4. 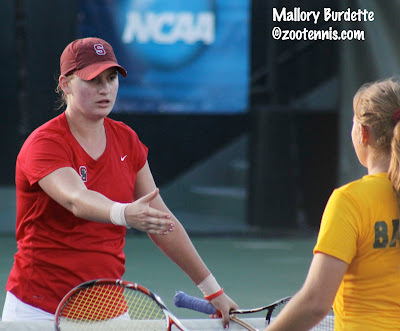 Burdette lost to North Carolina’s Zoe Bruycker, a 9 seed, 1-6, 7-6(3), 6-3. 2010 NCAA champion Chelsey Gullickson of Georgia, who is not seeded in this year's tournament, dropped the first set to Clemson's Keri Wong, but came back to post a 4-6, 6-3, 6-2 win. Men's reigning champion Bradley Klahn of Stanford, playing in front of approximately 2500 fewer people than in his team's quarterfinal match with Virginia, had a tough first set with Michigan's Jason Jung, but played the big points well and dominated the second set for a 7-6(5), 6-2 win. Men's No. 3 seed Michael Shabaz of Virginia certainly appreciated having to play only two games against Tulsa's Marcelo Arevalo, who was defaulted for three audible obscenities. In the very first game, Arevalo let loose a loud string of Spanish that contained a couple of common vulgarities, and he was given a point penalty, which gave Shabaz the game. In the next game, several line disputes arose, one of which was an overrule by the chair against Arevalo. During the ensuing argument, Arevalo was given a game penalty for unsportsmanlike conduct, making it 2-0 Shabaz. Men's tournament referee Jim Russell explained the final penalty, which is loss of the match. "The third was another audible obscenity and unfortunately Anthony (the chair umpire) speaks fluent Spanish, so I defaulted him. That's the procedure: point, game, default. I hated to do it, but that's what we've got to do." Russell, who has been the tournament referee at scores of ITA and NCAA tournaments for many years, couldn't recall a similar incident. "I called the (NCAA) committee and told them I've never had to do it that quick." Austen Childs of the University of Louisville, the 2010 finalist, advanced with a 3-6, 6-3, 6-2 win over Georgia's Wil Spencer, but 2010 semifinalist Tim Puetz of Auburn, a 9 seed, fell to University of Michigan's Evan King 6-3, 6-0. King saved a break point in the first game of the match, which he considered an important hold. "That was a big game," said the No. 21-ranked King, who is sporting a new hairstyle that he calls his "old school Will Smith Fresh Prince of Bel-Air" look. "This year in general, one of the reason I've made it to NCAAs and had a pretty decent year is that mentally when I'm down break points, I'm able to clearly decide what I want to do and be really solid, go for my shots." King, a sophomore, consulted with head coach Bruce Berque about strategy before the match. "I talked to Bruce about what I wanted to do in tough situations," said the left-hander from Chicago, Ill. "It happened to be the first game, when I was down break point, so it's good I was mentally solid to get off to a good start." Although King had never played Puetz, a senior from Germany, and said he wasn't aware of Puetz’s semifinal performance last year, he had received scouting reports from the players he knows in the SEC. "I knew what to expect. I heard he was capable of heating up on both sides, hitting big on both sides. So I just tried to mix it up, not go bang, bang, bang with him. It ended up working, because he got frustrated and it ended up going by pretty easily in the second." The second round of singles and the first round of doubles are slated for Thursday. 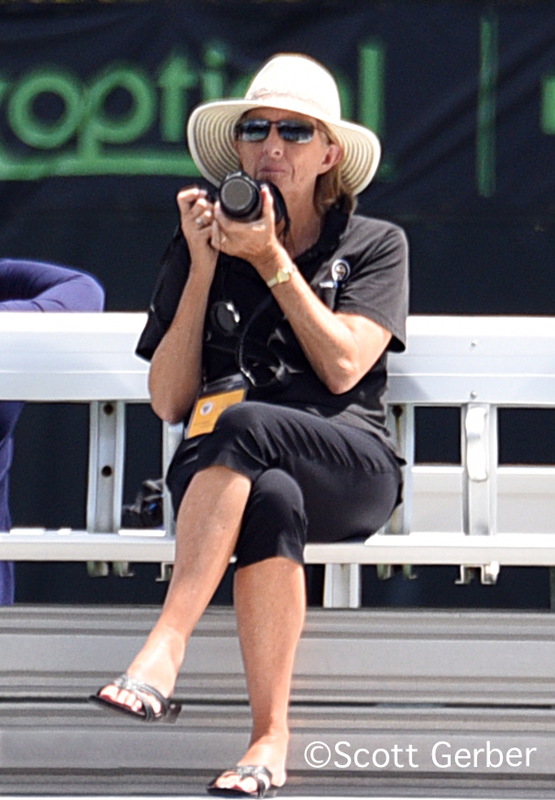 If any of the 2,863 spectators at Stanford University’s Taube Family Tennis Center Tuesday were attending a college tennis match for the first time, they are now undoubtedly fans for life. 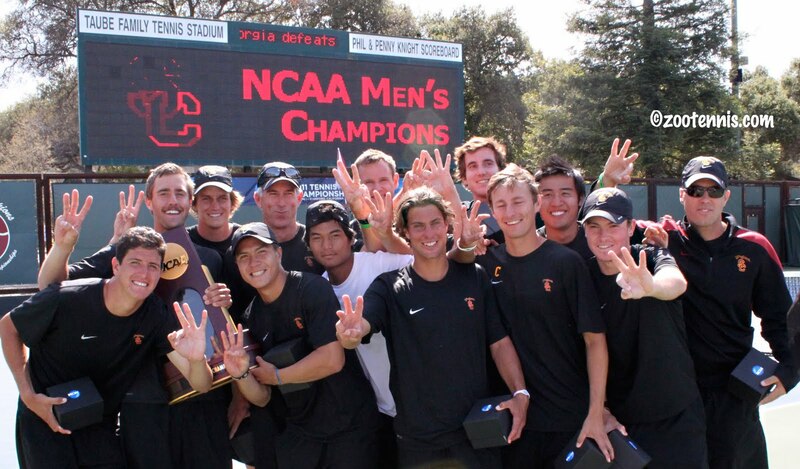 In two excruciatingly exciting 4-3 matches, the second-seeded Southern California men claimed their third consecutive team championship over top seed and undefeated Virginia, while the University of Florida women, also seeded No. 2, avenged last year’s heartbreaking loss to top seed and undefeated Stanford, ending the longest home winning streak in NCAA history. 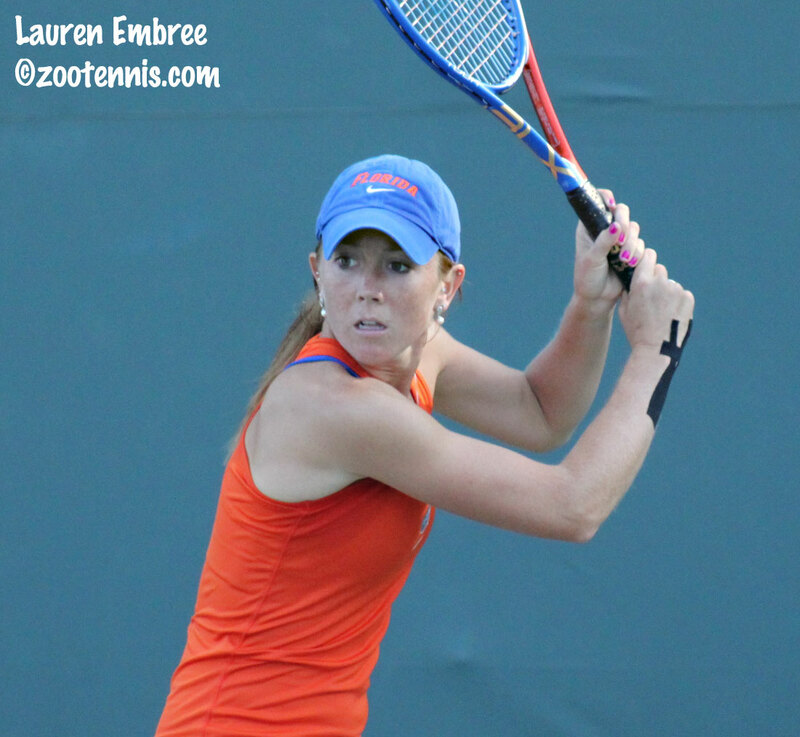 Florida sophomore Lauren Embree trailed 5-7, 6-3, 4-0 in the final set of her match with Stanford sophomore Mallory Burdette at No. 2, a match the Gators had to win. Florida’s Alex Cercone had just defeated Veronica Li 4-6, 6-1, 6-4 at No. 5 to make the score 3-2, while Olivia Janowicz had just earned a third set against Stanford’s Carolyn McVeigh at No. 6. Although that 4-0 deficit might have seemed a deep hole to those who aren’t familiar with Embree, both Burdette, a longtime junior rival, and Embree’s teammates knew better than to count her out. Embree held serve, broke Burdette at love, held, and again broke a sagging Burdette at love, and suddenly it was 4-4. By this time, at the far reaches of the stadium, Janowicz had taken a 4-0 lead on McVeigh, so the next few games would be critical in deciding the championship. Embree held again to make it 5-4, and Burdette looked as if she would lose her sixth straight game when she got down two match points at 15-40. But Burdette saved both, ending her spiral with a forehand volley winner. The Stanford crowd, having fallen silent during the lengthy stretch of Burdette errors, began to regain their voices. Embree held again for 6-5, while Janowicz had worked her way to a 5-1 lead on court 6. Burdette, serving to stay in the match, fell behind 0-30, but held with the assist of a let cord on an overhead and a forehand winner. The tiebreaker had just begun when Janowicz completed her 6-7(6), 6-3, 6-1 victory, assuring every eye in the stadium would be on court 2 as the sun set and the lights came on. Embree led 4-2 at the changeover, but Burdette hit two aggressive volley winners to pull even. After Burdette missed a forehand return and netted another forehand, Embree had two more match points. Glancing over at her coach and teammates, Embree’s eyes said she was ready to finish this time, but Burdette again denied her, hitting a good first serve and forehand winner to make it 6-5. Embree saw chance number four evaporate when her defensive lob went just long, and the crowd again raised its decibel level in support. In the deciding match of the 2010 Team Championship in Athens, it was Burdette who came up with all the big shots against Florida’s Marrit Boonstra, but she couldn’t summon that magic again. She missed an overhead badly to give Embree her fifth and last match point, and when Burdette sent a forehand long, the Stanford fans were left to silently contemplate the team’s first home loss since February of 1999. It had looked promising for the Cardinal, when, despite the loss of the doubles point, they had taken the lead with wins by Hilary Barte, who beat Allie Will 6-2, 6-4 at No. 1, Nicole Gibbs, who defeated Sofie Oyen 6-4, 7-5 at No. 3 and Stacey Tan, who outlasted Joanna Mather 3-6, 6-2 6-4 at No. 4. 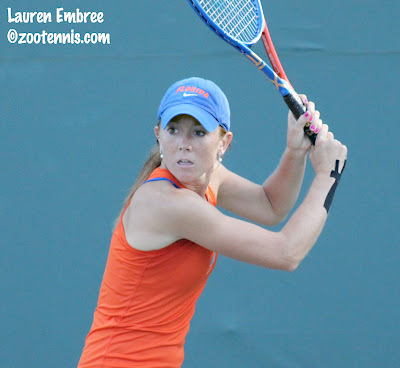 Cercone and Janowicz’s victories were every bit as important as Embree’s, but Florida head coach Roland Thornqvist knew who he wanted on the court in a moment as pressure-packed as a tiebreaker to decide a national championship. “When it came down to Lauren, I was thinking, hey, we’ve got the one we want at the end,” said Thornqvist, joking that the match had taken ten years off his life. Thornqvist was obviously delighted with the Gators’ national title, their fifth overall and his second as head coach, but the memory of last year’s 4-3 loss to Stanford was still fresh. Burdette was fighting tears while on the press conference podium, flanked by teammate Barte and head coach Lele Forood. “Obviously it’s not as fun being on this side,” Burdette said, her voice breaking. Forood, who described the atmosphere as the most electric in her experience, spoke matter-of-factly about the end of the winning streak, the longest in NCAA history in any sport. The men’s team at University of Southern California has an impressive streak of its own going right now after winning their 18th straight NCAA match and third consecutive title. “For some reason in LA, winning three is pretty tough,” said USC head coach Peter Smith, mentioning the Lakers second round loss in the NBA playoffs and the Trojan football team’s loss to Texas in the 2006 national title game. But with junior Daniel Nguyen, Smith has his own Kobe Bryant, the go-to guy when the title is on the line. After Virginia had mounted a furious comeback to level the match after trailing 3-0, the championship would be decided on court 3, where Nguyen and Cavalier senior Sanam Singh were fighting for the last point. USC had taken the doubles point with little resistance from Virginia, and quickly added a second point with Emilio Gomez’s 6-0, 6-3 victory over Justin Shane at No. 5. Trojan junior Steve Johnson, the tournament’s most outstanding player, defeated Michael Shabaz 7-6(2), 6-3 at No. 1, but the five first sets that USC won were not holding up. Alex Domijan, Singh, and Jarmere Jenkins all forced third sets, while Peter Lucassen of USC also evened his match with Julien Uriguen at No. 6. Shortly after Johnson made it 3-0, Domijan collected a 3-6, 6-3, 6-4 victory from Jaak Poldma at No. 2, with Uriguen completing a 6-2, 1-6, 6-3 win to make it 3-2. Jenkins and Raymond Sarmiento were at nearly the same stage in their match at No. 4 as Nguyen and Singh, with Jenkins up a break. Nguyen got his break when Singh double faulted serving at 2-3, and held to take a 5-2 lead. After his performance as a freshman in the Trojans’ 2009 title match and his clinch over Tennessee last year, Nguyen had earned his reputation as a closer, but there certainly was drama yet to come. At 2-5, Singh saved a match point with a good serve down the T that Nguyen pulled wide, then held to make it 5-3. Serving for the match, Nguyen didn’t get another match point, but he did save four break points before finally surrendering the game, putting Singh back on serve. Down 0-15, Singh was the victim of an ESPN Sports Center Top Ten play when Nguyen reacted to a perfectly executed Singh volley with a desperate forehand dive that somehow cleared the net. At 15-40 Singh saved his second match point with a drop shot winner, but Nguyen, who had played less confidently when he was serving, forced the action, putting away a backhand volley to post a 7-5, 0-6, 6-4 win. The Trojans had earned their third championship in a row, the only team other than Stanford to accomplish that, and their 19th national team championship overall. Smith, smiling on the sidelines of the Nguyen match despite the stakes, insists that his players appreciate the excitement in moments like these. For Virginia coach Brian Boland, losing to Southern California for the third straight year was painful, but he expressed pride in the way his team came back. The NCAA individual singles and doubles tournament begins on Wednesday, with USC Steve Johnson and Cal-Berkeley’s Jana Juricova as the top seeds. For complete draws, see gostanford.com. As is the tradition, the ITA announced its National Player Award recipients at a brunch this morning. Three of the four finalists in Tuesday’s NCAA Division I Team Championships are back where they ended the 2010 season. The Stanford women and University of Southern California men hope to retain the titles they won last year in Athens, Ga., with the Florida women trying to find the one point that eluded them in their 4-3 loss to the Cardinal. The fourth team can hardly be considered an outsider. The top-seeded and undefeated University of Virginia men have been the tournament’s No. 1 seed the past four years, but advanced to their first final Monday with a 4-2 victory over No. 4 Ohio State on another clear but cool day in Northern California. Several hundred Cavalier fans, instantly identified by their orange T-shirts, made the coast-to-coast trek, giving Stanford University’s Taube Family Tennis Center the feel of a home match for the Virginia players. But when Ohio State took the doubles point, with 8-6 wins at No. 2 and No. 3, there wasn’t much noise from the Wahoo cheering section. The quality of the tennis in those three doubles matches was astoundingly high, with momentum shifts and huge points happening simultaneously, and the Buckeyes were obviously excited to have taken the lead. The Virginia singles lineup is exceptionally deep, however, and even without Drew Courtney, who was once again held out at No. 5 singles, the Cavaliers took four first sets in singles. Virginia freshman Alex Domijan got the first point for his team with a 6-2, 6-2 win over Chase Buchanan at No. 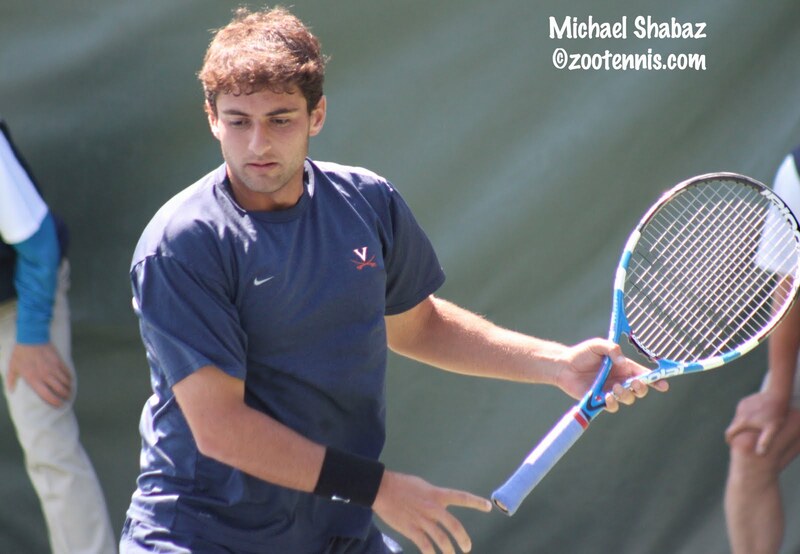 2, and Michael Shabaz made it 2-1 Cavaliers with a 6-4, 6-4 victory over Blaz Rola at No. 1. Ohio State didn’t go quietly, however, and when Matt Allare came back from 5-2 down in the second set to force a third in his match with Jarmere Jenkins at No. 4 , the Buckeyes still had hope. When Devin McCarthy gave Ohio State its second point with a 6-2, 4-6, 6-3 win over Justin Shane at No. 5, the other four singles matches were all in third sets. Fortunately for the Cavaliers, they had substantial leads in two of the them, and within minutes of each other, Jenkins had point No. 3 with a 6-3, 6-7(3), 6-2 decision, and Sanam Singh earned No. 4 with a 4-6, 6-3, 6-1 victory over Ille Van Engelen at No. 3. Both Boland and Jenkins expressed their appreciation for the support of their fans. A veteran of such big occasions, USC junior Daniel Nguyen, who clinched the Trojans title last year over Tennessee and won the fourth point in USC’s shutout of No. 6 Georgia Monday, knew a surprise was awaiting his team. 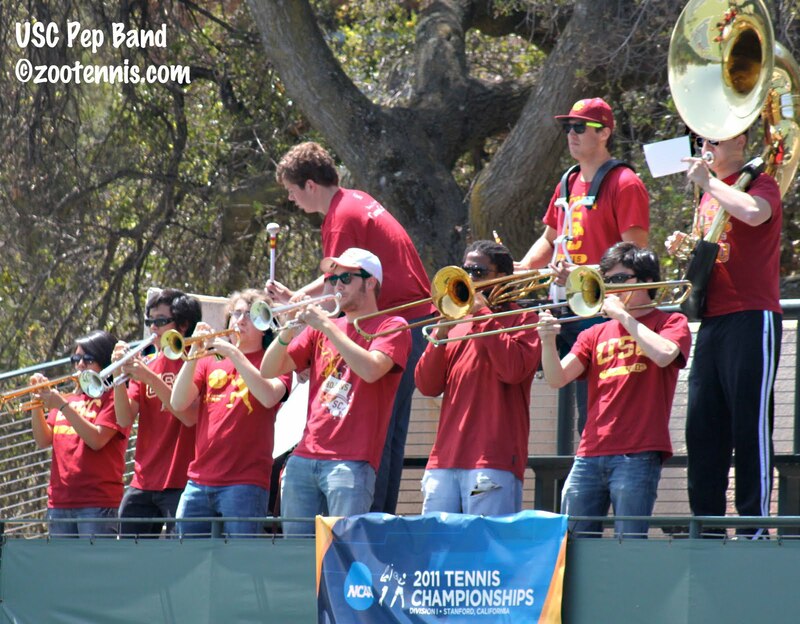 Head coach Peter Smith had promised one, but it wasn’t until they heard the first strains of the USC fight song “Fight On,” played by ten members of the university band, could the team guess what was in store for them. “Having them is just a huge advantage,” Nguyen said, as the trombones and coronets blared in the background. “Their music just pumped me up from the first point on in doubles. I didn’t know they were coming, and it was sweet to have them. The band members were actually accompanying the USC football and basketball coaches on a trip to Northern California, and happened to be in the area, so Smith arranged for their appearance in Palo Alto. Whether it was due to the band, the team’s 16 consecutive NCAA tournament wins, or what Smith called their “calm,” USC played focused and motivated tennis against Georgia, taking the doubles point and three straight-set singles wins. 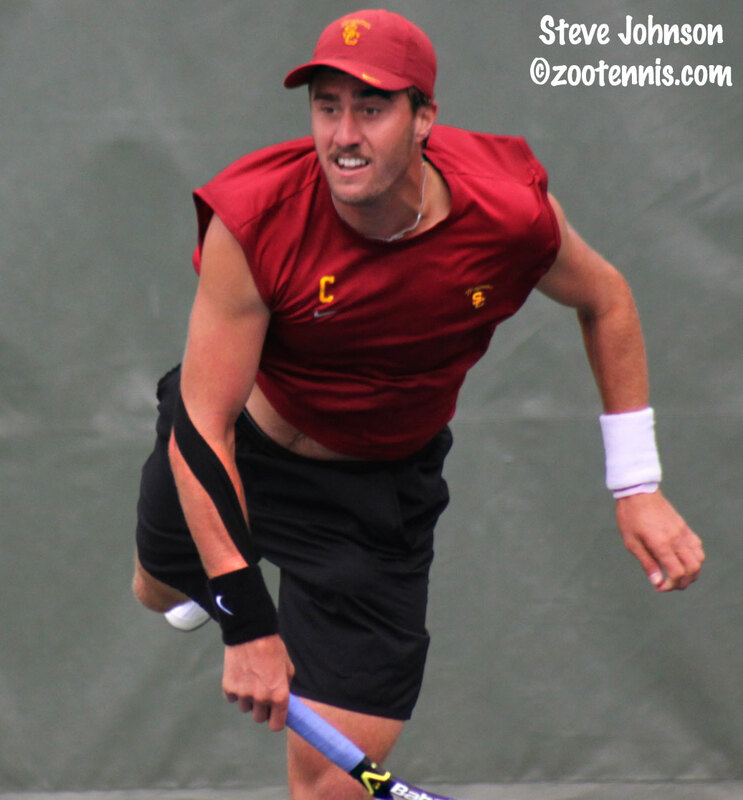 The nation’s top-ranked collegiate player, Trojan Steve Johnson set the tone with a 6-0, 6-0 victory over Wil Spencer at No. 1. Raymond Sarmiento followed, beating Drake Bernstein 6-2, 6-3 at No. 4 to make 3-0, leaving Nguyen to finish with a 6-3, 6-3 win over Sadio Doumbia at No. 3. Smith is looking forward to taking on the Cavaliers, the first time the top 2 seeds have met in the NCAA finals since 2006 in Palo Alto, when Pepperdine surprised top seed and undefeated Georgia. In the women’s final, there is no disparity in that department. Stanford and Florida are the two most successful programs in women’s Division I tennis, with Stanford claiming 16 titles and Florida 4. Last year, the Cardinal overcame the loss of the doubles point to claim four singles matches from the Gators; freshman Mallory Burdette clinched for Stanford with a 6-4, 6-7, 7-5 victory over Marrit Boonstra of Florida. Boonstra is one of the few players not returning to Tuesday’s final match, with possibly nine players from the 2010 championship taking the Taube Family Tennis Courts, where Stanford has won 184 consecutive matches. Burdette clinched Monday’s 4-1 semifinal win over No. 5 Baylor, taking a 7-5, 6-4 decision from Nina Secerbegovic at No. 2. The sophomore from Georgia didn’t show much emotion after her victory however, admitting it was less intense than last year’s experience. Although Stanford won the doubles point, Baylor got on the board very quickly when freshman Kristie Ahn reinjured her ankle against Jelena Stanivuk at No. 4 and was forced to retire leading 2-1 in the first set, leaving her status in doubt for Tuesday’s final. “She’s going to be in the training room a lot, so we’ll see,” said Stanford coach Lele Forood. Stanford’s second point came from Stacey Tan, who followed up a 6-0, 6-0 win in the quarterfinals with an efficient 6-1, 6-4 victory over Karolina Filipiak at No. 5. Veronica Li gave Stanford a 3-0 lead with a 6-4, 6-3 win over Taylor Ormond at No. 6, leaving Burdette as the most likely final point. Secerbegovic had served for the first set at 5-4, but lost three straight games, and she didn’t fare any better at the end of the second set, with Burdette getting a break at 4-5 to complete the Cardinal victory. After his team’s loss, Baylor coach Joey Scrivano said Stanford was “better than us, and they’re better than every team in the country,” an assessment that Florida head coach Roland Thornqvist didn’t argue with. Florida took the doubles point, and came out strong in singles, winning four first sets. Lauren Embree made it 2-0 with a 6-2, 6-2 win over Noelle Hickey at No. 2, and Alex Cercone made it 3-0, taking a 7-5, 6-3 decision from Courtney Dolehide at 5. It looked as if UCLA would get on the board at No. 4 when Pam Montez had two match points on Joanna Mather at 6-4, 5-0, but Mather came all the way back to earn a split. Mather’s comeback gave Allie Will the opportunity to make it a shutout, and she didn’t waver, taking out McCall Jones 7-6(7), 6-2 at No. 1. Florida’s sole loss this year was in the final of the Team Indoor in February, but Thornqvist has no desire to dwell on the fact that Stanford has inflicted his team’s last two losses in national tournament finals. The finals, which will be shown live on ESPNU, begin at noon Pacific time with the men’s final, followed by the women’s final at 4 p.m. Tape-delayed broadcasts of both finals will be available on ESPN2 beginning at 10:30 p.m. Eastern time. 2) Gomez/Johnson (USC) vs. Doumbia/Taboada (UGA) aban. 2) No. 38 Jaak Poldma (USC) vs. No. 32 Javier Garrapiz (UGA) aban. 5) Emilio Gomez (USC) vs. Ignacio Taboada (UGA) aban. 6) Peter Lucassen (USC) vs. Hernus Pieters (UGA) aban. 1) No. 2 Courtney/Shabaz (UVA) vs. No. 21 Allare/Kobelt (OSU) aban. 6) Julen Uriguen (UVA) vs. No. 111 Balazs Novak (OSU) aban. 1) No. 2 Cercone/Will (FLA) vs. No. 23 Dolehide/Remynse (UCLA) aban. 3) No. 91 Sofie Oyen (FLA) vs. No. 76 Andrea Remynse (UCLA) aban. 4) No. 42 Joanna Mather (FLA) vs. No. 97 Pamela Montez (UCLA) aban. 6) Olivia Janowicz (FLA) vs. Maya Johansson (UCLA) aban. 1) No. 3 Hilary Barte (STAN) vs. No. 14 Sona Novakova (BAY) aban. 3) No. 18 Nicole Gibbs (STAN) vs. No. 47 Diana Nakic (BAY) aban.